You entered an invalid username or password. This account is locked due to too many failed login attempts. Please email contact@skydroid.net for assistance. This acccount has not been activated yet. Please check your email account for our activation email. You don't need to login to use the app or add courses. Login/Registration is required for storing rounds on our system or for editing Scorecard info. 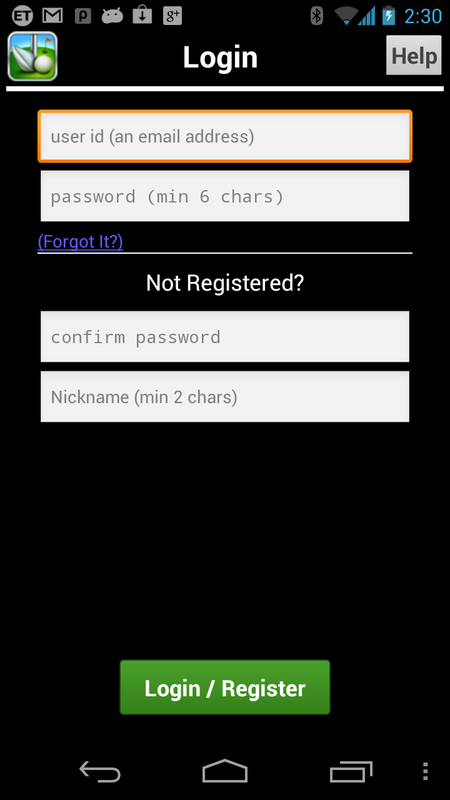 Login is only availble for Android and BB10 phones/tablets at the moment. Coming soon to other platforms. Use the navigation bar to go to any page. As of now, login is for scoring and stats which is not yet available on the iPhone/iPad version of the app. Hopefully we will be adding this functionality soon. Check the Upcoming Features section on the home page for updates. Download the latest version of SkyDroid for Android or BB10. Click on the Scores Tab, then click the Login button at bottom. Fill out the Login/Registration screen, top and bottom parts, and click "Login/Register". Click the link in the account activation email we will send.